The Willow School offers a fun and engaging school age program for children 6 to 12 years of age weather your need for care is before and after school hours, elementary school holidays or early dismissal days. Based on the premise that learning happens every day, all day, our program has been designed to meet the growing educational needs of children. Not only will your student get to spend time with friends, enjoying activities that are relevant to school-age interests, trained teachers will also provide students with homework help and skills enhancement along. The Willow School provides daily private transportation to and from many of the neighborhood schools in Norristown. We also meet the NASD school buses at stops conveniently located to at the corner of the school. 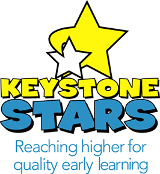 Keystone STARS has rated and recognized The Willow School as a STAR 4 program. The highest rating for providing quality early learning experiences for favorable outcomes that help your child succeed. The Willow School does not exclude, deny benefits to, or otherwise discriminate against any person on the basis of race, color, national origin, disability, or age in admission to, participation in, or receipt of the services and benefits under any of its programs and activities, whether carried out by The Willow School directly or through a contractor or any other entity with which The Willow School arranges to carry out its programs and activities.